Don’t worry, I’m not about to take on the craft bloggers, I am far from crafty or handy, but here’s an idea that worked well in this house a few weeks ago that I thought I’d share. I’d love to take credit for the idea it, but it’s 100% Ciarán. Or somewhere that he stole the idea from, possibly the TV. It kept us busy for an entire rainy Saturday afternoon though so I thought I’d share it for the inevitable wet days that we will have to entertain the smallies. The boys have a tendency to start what they calls “collections”. These can be of stones, pinecones, leaves, bottlecaps, twigs, anything really, there are little nappy bags full of them in my car, and my boot is full of sticks, you can’t walk in a wood without a stick in your hand. The more likely I am to declare them rubbish and bin them, the more precious they are. Ciarán forages in the recycling bag before things get exiled to the green bin and scolds us for not reusing everything. He had started a collection in a shoebox recently and Cathal’s interest was piqued. 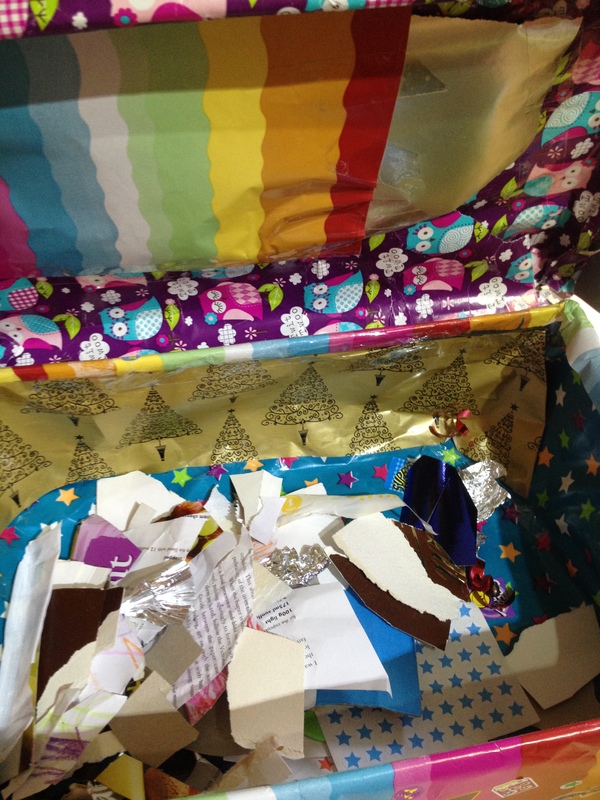 Ciarán christened his box of (mostly) rubbish his “Secret Special Box”. A week passed and Cathal came into the kitchen sobbing on this wet Saturday afternoon. Through the tears he was able to tell me that the problem stemmed from the fact that he “didn’t have a secret special box”. Daddy was dispatched to locate an empty shoebox and Supermammy got to work. it helped that Laoise was napping. Ciarán’s box at this stage was still a regular shoebox that he had written “Secret Special Box” on so he thought it could do with a makeover too. I brought lots of odds and ends of wrapping paper to the kitchen table, a scissors and random stickers that were in the make and do box. I let the the three year old direct me which wrapping paper that he wanted on each part of the box, covering the lid too, and the insides, clashing did not come into it, it was all about what they wanted. He helped with the sellotape and the folding. The five year old worked away on his own, getting me to help when he needed it. When the boxes were wrapped and sellotaped I gave the boys a piece of white paper to stick on as a name sign, I wrote Cathal’s for him and Ciarán wrote his own and then I let them colour the signs and decorate the boxes with their stickers. make and do, rainy day activities. Bookmark.